When it is dry, sewage and wastewater from our homes, businesses and industrial buildings combine in system of pipes and sent to the wastewater treatment plant. After water is cleaned, effluent is released to the river. 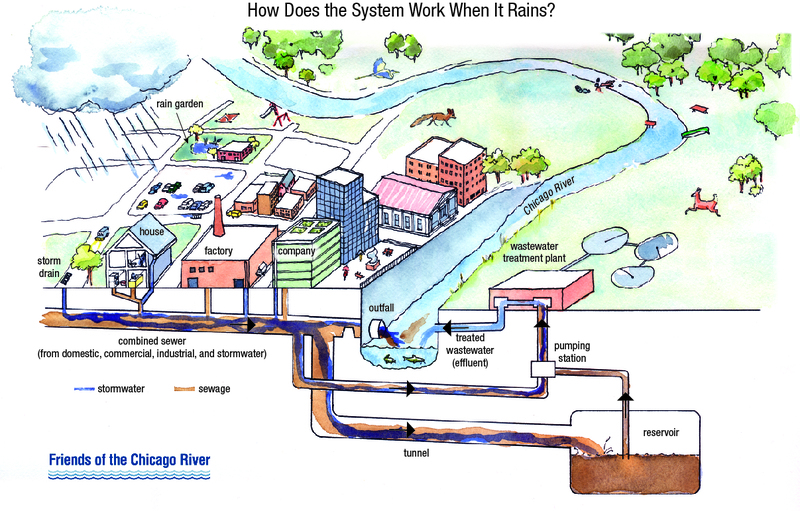 When it rains, stormwater (blue water in illustration) is often collected from streets, rooftops, parking lots and other hard surfaces and sent to the sewer system where it combines with sewage (brown water in illustration) from homes, businesses and instrustrial buildings. When volume is high due to intense rainfall or rainfall over several days, pipes fill to capacity, excess flows to tunnels and resevoirs where it can be stored and later pumped to wastewater treatment plant for processing. However, volume can be too high with intense rain events and long lasting rain events, and stormwater and wastewater combine in pipes and exceed the tunnel capacity. This triggers a combined sewer overflow (CSO) and sewage is sent to river via an outfall designed specifically to release wastewater when volume is excessive. According to the MWRD as little as .3 inches of rain may trigger a CSO, depending on location and intensity of rainfall. 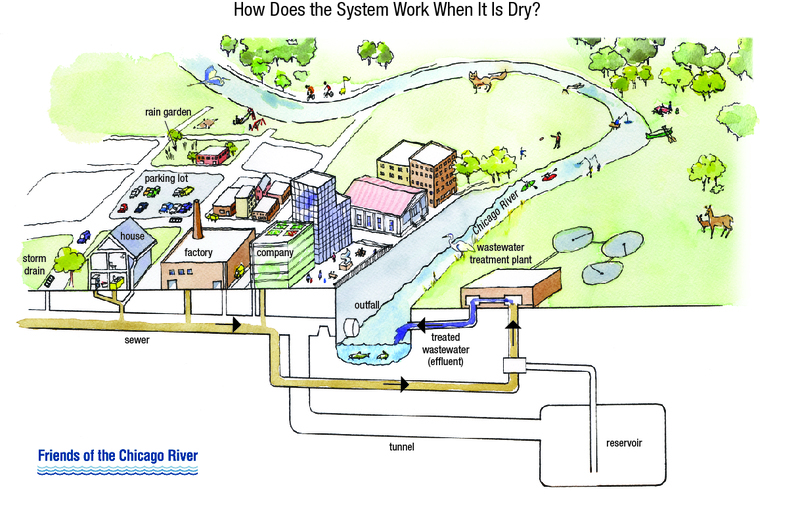 By designing and building green infrastructure, we can reduce stormwater that is being sent into the sewer system. Concepts like roof gardens, rain gardens (using native plants), and disconnecting downspouts are all important in reducing the water load to our sewer system. Water conservation at home also plays an important role in reducing CSOs to the river.